Which Solitaire game should I play? Klondike, named after the Klondike gold rush of the late 1800s, is one of the most popular solitaire games. Indeed, until computer solitaire games in the 1970s and 1980s and the popularisation of Freecell, if you talked about playing "patience" or "solitaire", the game you were probably referring to was Klondike. 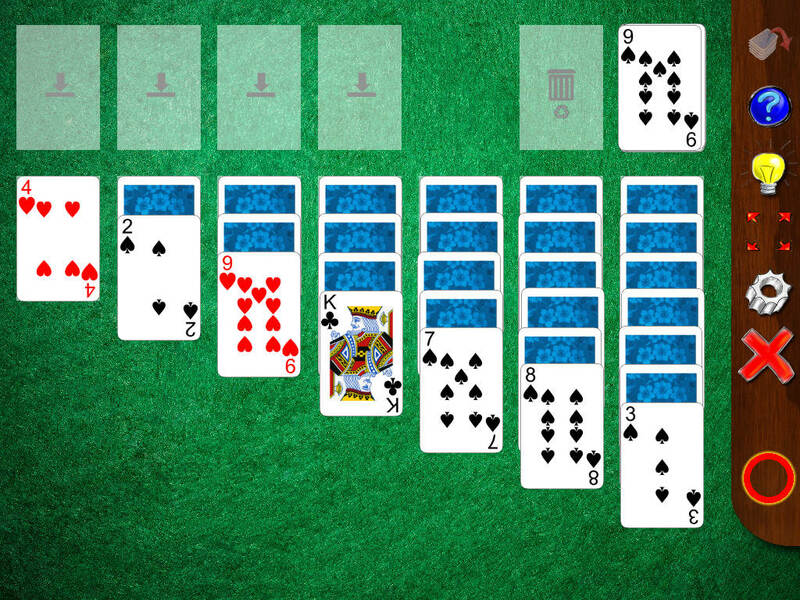 The version of Klondike included in Solitaire Whizz for iPad is specifically a version sometimes referred to as Klondike Classic, or "infinite redeals" or similar variations. In this version, you can re-deal the cards in the stock pile as many times as you like, stepping through the stock cards one at a time. If you enjoy Klondike but would like a game with a bit more strategy and a higher success rate, then check out Whitehead, included in Solitaire Whizz 1.4 onwards. Initially, seven columns are laid out to form the tableau, with one card in the first, two in the second etc. Cards are dealt face down, except for the bottom card of each column. The initial tableau therefore forms a 'triangle' as illustrated below. The remaining cards form the stock pile. The aim is to build all cards on to the foundation piles, one pile per suit. As the Aces become available, build them on to the foundations, followed by the corresponding 2s etc. The face-up cards at the bottom of any foundation column are available for play at any time. An available card may be played on to a foundation (ascending order, one foundation per suit) or on to the bottom of another column. To build on to another column, you must do so in downward sequence, alternating red/black. Whole sequences of cards may also be moved from one column to another, provided that they respect the descending, red/black sequence. The top card of the stock pile is also available for play at any time, either on to a foundation or on to the bottom of a column. If the top card of the stock pile cannot be played, double-tap it to move it on to the waste pile, revealing the next card of the stock. Empty columns may be filled with a King (or a whole sequence starting with a King). Once you have gone through the entire stock pile, you may tap the redeal icon. This gathers up the waste pile (i.e. the cards from the stock that you have not been able to place so far) and redeals them back on to the stock pile for you to go through again. In this version of Klondike, you may have as many redeals as you wish until the game gets stuck. Solitaire Whizz will also prompt you to redeal automatically once you have gone through the stock and there are no moves left on the tableau. try not to be too hasty in moving cards from the stock pile on to the tableau when there is a chance that you could be 'blocking' a potential move from one column to another that would reveal a face-down card. Not every single game of Klondike is solvable. Around 80% of games are solvable in principle. But, unlike a game such as Freecell, you do not start with perfect knowledge of where the cards are due to the face-down cards in the tableau. This means that in practice, you will probably expect to solve about half of all games.